After four years and counting of life under the same roof and clothes in the same closet, I feel like we’re reaching a tipping point in our closet’s ability to contain all of our clothes, shoes, & accessories in an organized way. 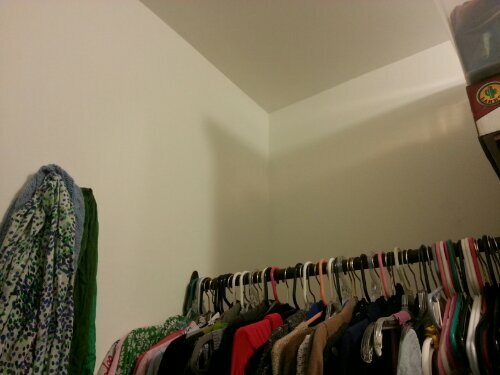 Conveniently enough, it’s been really easy to just shut the closet door and pretend the monster isn’t there, but I feel that organized closets are something that make your house a happy, less stressful place to live. Plus, it can be hard to fall asleep with a monster nearby. While getting ready for work in the morning, already not my favorite time of day, it’s an unnecessary source of stress to fight with a pile of stuff when all of it could be [somewhat] easily organized and accessible in the unused spaces of the closet. And with the already small closets that come with an old house, it just seems foolish to leave any space within unused. I should mention that my side of the closet is where the monster lives, which has motivated me even more when looking at Robby’s neat half next to my exploding-with-accessories half. 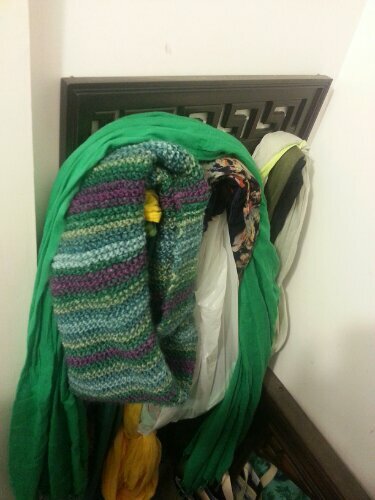 I’ve had a rinky 3-peg board on my side that doesn’t even pretend to hold half of my scarves, yet alone any bags or purses. The first step was to remove the 3-pegger, which took two seconds since I installed it before our adventures in hanging heavy stuff on the walls taught us how to hang things correctly! Next, I hung four double hooks at around seven feet high. These are slated for my ever-growing scarf collection (want to get me a present? scarves make me happy!) and a couple of bags with long straps. The tools I used for this were: a stud finder, screw driver, hammer, & an electric drill. Areas of the wall with studs behind them only needed a screw to hold up the hook, and areas without a stud needed a drywall anchor + screw to hold the hook. This is pretty basic and goes quickly if you’re accustomed to using an electric drill, which I am not! Thankfully Robby was there to look on and let me know when I wasn’t holding the drill in a straight line, which was the only hard part on this project. 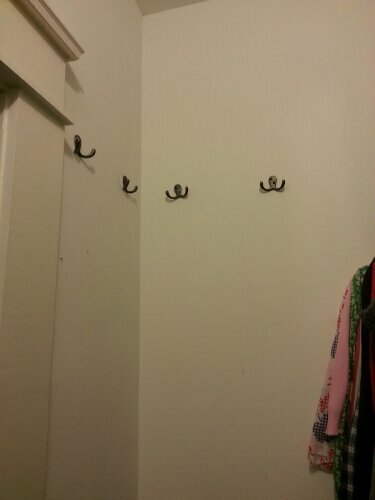 First, I marked the wall where I wanted to hang the hooks. Next, I used the stud finder to determine which hooks would need anchors (areas without studs behind them), and then pre-drilled holes the size of the anchors before hammering them as flush with the wall as I could. Then, while holding the hook over the anchor, I used a screw driver to install the screws. For areas of the wall with studs, I pre-drilled holes the size of screws, and installed the screws with the other hooks. Now that all of this is out of my “miscellaneous” pile on top of the laundry basket, I can actually reach the full length of my clothes bars. 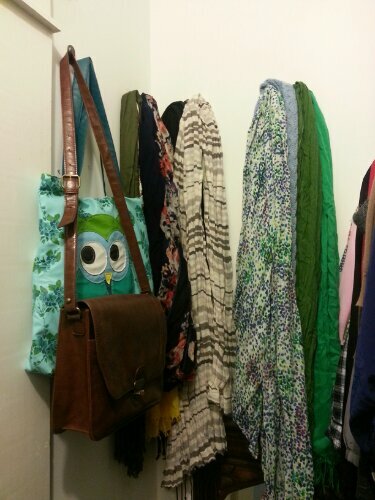 The next phase of organizing will include a set of lower hooks (around three feet) for bags with short straps, and a shelf above my top clothes bar for boots, hats, and presents I’m hiding from Robby seasonal items. Who needs an expensive off-the-shelf closet organizer, which might not completely work with your space and your stuff, when you can customize your storage modules to the space you have and things you want to store? I’m really looking forward to getting more comfotable with using tools around the house, which I think is an important step for all homeowners, and especially women. How fun to be able to plan a project and execute it independently, without having to make a “honey-do-list” for your parnter in order to complete it. There’s nothing stopping you from learning how to use all of these tools (and more! ), and you’ll probably share my satisfaction when you do. This entry was posted in Don't Hire a Professional, Mood Boosters, Tools and Techniques, Uncategorized, women like tools too and tagged closet, DIY, organization. Bookmark the permalink. 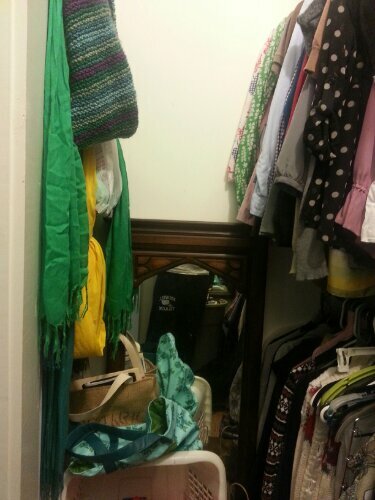 Please come help me with a closet make-over. Great job! Love your site!